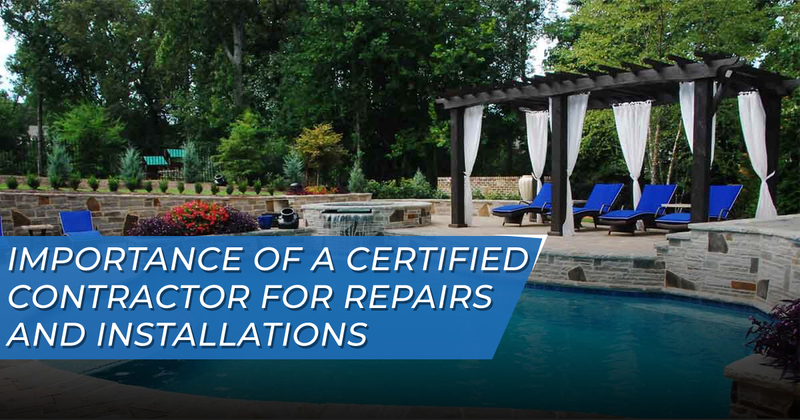 If you want to have a well-functioning swimming pool that will serve you for years to come, it needs to be properly installed and maintained by certified professionals. Minor mistakes in installation or subpar maintenance can result in a significant amount of expenses incurred in the long run. Your pool’s quality and durability depends on the contractor you hire. To help you get the best out of your pool, securing the services of a certified contractor is one of the best moves you can make – it will give you plenty of benefits that go beyond the financial aspect. When starting construction for your pool, one thing you’ll have to take care of are the legalities. There are different rules, regulations, and requirements in place, depending on your location. Going through the process can be very time-consuming and overwhelming, which is why it helps to have a reputable contractor by your side. A contractor will help you through inspections, permit acquisition, and other required processes, so you won’t need to deal with any potential legal issues regarding your pool. In addition, a certified professional is an expert when it comes to pinpointing issues before they turn into serious problems. They can recommend options and tell you what you need to know so you and your family can avoid potential hazards or accidents. Most contractors offer warranty that will cover workmanship for your pool for a specific length of time. The length of the warranty offered may vary depending on the contractor, but it’s usually for a full year, which is the industry standard. Keep in mind that workmanship warranty is different from the one offered by manufacturers of your pool’s shell or equipment. This particular warranty covers major issues related to the pool’s installation, such as structural settlement or movement of the pool, plumbing leaks, or leaks within the fittings. Maintaining a pool is hard work, so you want to get the services of a professional that can make sure your swimming pool is always in tip-top condition. A certified professional will be in charge of checking the condition of your filter tank and pump, analyzing the chemical balance, checking for surface skimming, debris removal, and many more. Pool professionals can also conduct tests to see if there are any existing problems with your pool’s structural integrity. This is an important step, as discovering any potential defects earlier can help reduce overall costs in the replacement or repair of any defective parts. Inspections performed by a swimming pool professional are helpful in accurately diagnosing problems, and will provide you with an effective plan of action to help you save valuable money. Another benefit of hiring certified technicians is chemical storage. When a certified professional is responsible for maintaining and cleaning your pool, they’ll be in charge of storing the chemicals required. This takes away the risk of keeping them in your house, as chemicals such as calcium hypochlorite, chlorine, and other pool cleaning chemicals tend to be hazardous and corrosive. If you need to hire a certified technician to help you maintain your swimming pool, get in touch with us by calling 813-948-9091 (Lutz) or 813-345-8596 (Land O’ Lakes).